"Joey Ramone was my boyfriend...he would have enjoyed the music on this album." 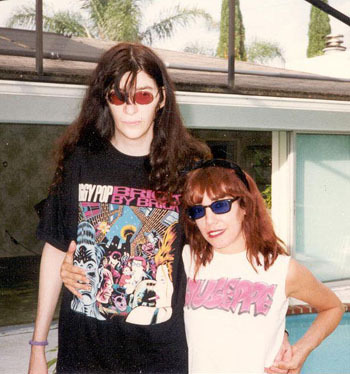 Virginia Macolino (Berlin) with Joey Ramone in 1991. My first recollection of music was when I was a young girl, and my dad played some records of those wonderful big bands...Glen Miller, Benny Goodman, etc. on our old record console. After listening to the This Is Vintage Now compilation CD, I found every song on this album wonderfully produced, deservedly showing all of these artistic talents. From the nostalgic "Tea For Two", to a most haunting song "If Hawthorne Were Foggy", to an upbeat jazz song, "The Deacon Don't like It", to a song much to my liking, "Piece," I enjoyed this macrocosm of music from past times to the present. Joey Ramone, who was my boyfriend for a time, would agree. I knew him well, and I know he would have enjoyed the music on this album. He had an eclectic, wide-range spectrum of musical likes and appreciation, unbeknownst to many. I was astounded at the energy these artists put into celebrating the great classic sounds. There should be a law about ‘coolage’. These guys broke it! 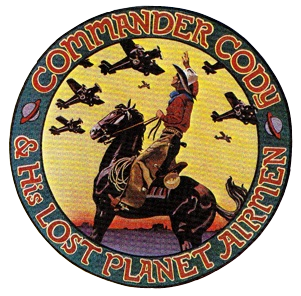 "Very clean sounding project, excellent arrangements. I love it!" [R]eally enjoyed your compilation, especially [the] saxes on [The] Nerco-Tonz and [the] modern versions of jump and jive! "Wow, what great talents featured on this album...great sounds and memories that take me back in time, I thoroughly enjoyed it." "This is Vintage Now is the ultimate "what's old is new" compilation. Terrific variety and awesome tunes. A must have for anyone with working ears." There are so many artists around making amazing period-influenced music that I thought it would be great to see a compilation mixing it up. This would have been the first time it'd been done but I got pipped to the post by the very friendly US Vintage connoisseur, promoter and musician, David Gasten (his CD 'This Is Vintage Now' introduced us to the delights of Caro Emerald in fact), but nevertheless, I have a different take on it. "When used as a noun, one definition of the word "Vintage" is, "The time that something of quality was produced". 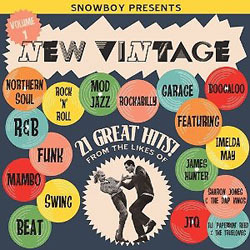 Based on that definition, This Is Vintage Now ~ the album compiled by David Gasten ~ is perfectly named. With its variety of musical stylings, each successive listen has brought me more and more appreciation for the singers, players, songs, and the guy whose vision brought them all together. Get a copy and see what it can do for you!